On Friday I went to Jones Park (in Fort Atkinson) at 2:30 to throw off of the pitcher’s mound. I’ll be throwing out a first pitch in Miami on Wednesday and I haven’t thrown off a mound in years. I pitched one inning in Teeners back in 2002 (striking out the side on 10 pitches). My friend Josh met me at the park and we played catch as I backed up towards the mound. I thought we were getting close to the 60 foot distance until I turned around and realized the rubber was still 15 feet behind me. 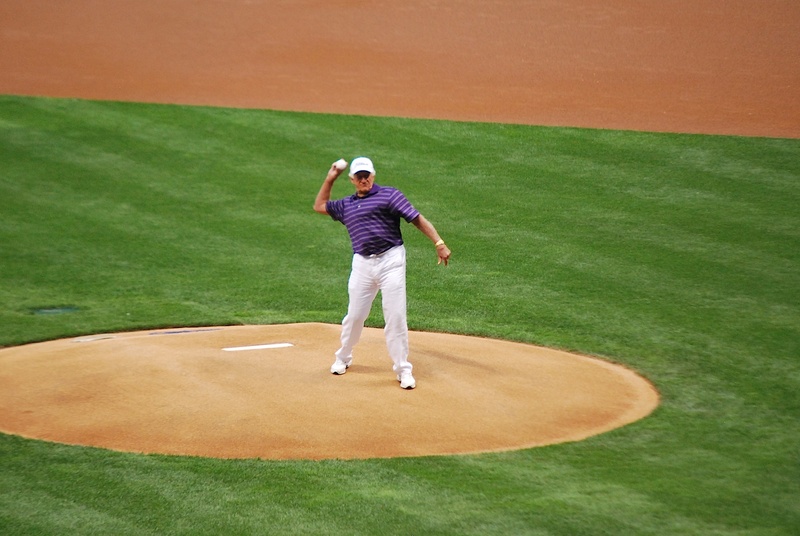 I probably threw 15 pitches off the mound. Six of them were strikes and I didn’t bounce a single one. All this means is that I will likely bounce it when it counts on September 5th. I’ll post footage of it after that game, assuming that it’s not too embarrassing. I stopped and had lunch/dinner at Culver’s before leaving for the game at 3:30. I was parked in the Miller 1 lot by 4:20 and made my way back to the general lot to hand out cards and talk about my mission and Be The Match. As I was walking away from a tailgate I heard one of the guys say “he wasn’t invasive or anything, he was chill.” He wasn’t saying it sarcastically so that made me feel good, one thing I don’t want to be is annoying. 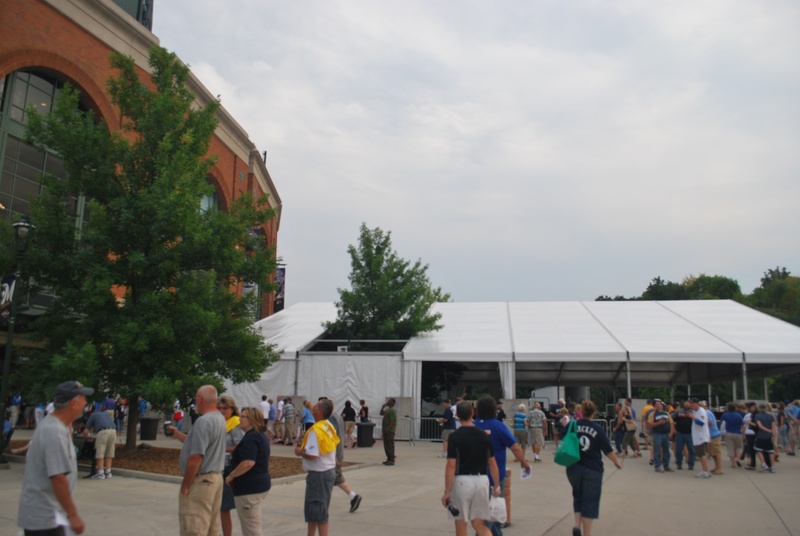 Friday was the Bob Uecker statue unveiling and they had a tent set up to house the ceremony. I had asked if I could attend but they had to try and squeeze 550 people into a 450 person tent. If you want to see the ceremony in its entirety you can click here. I went inside at 6:20 and met up with my friend Jason. 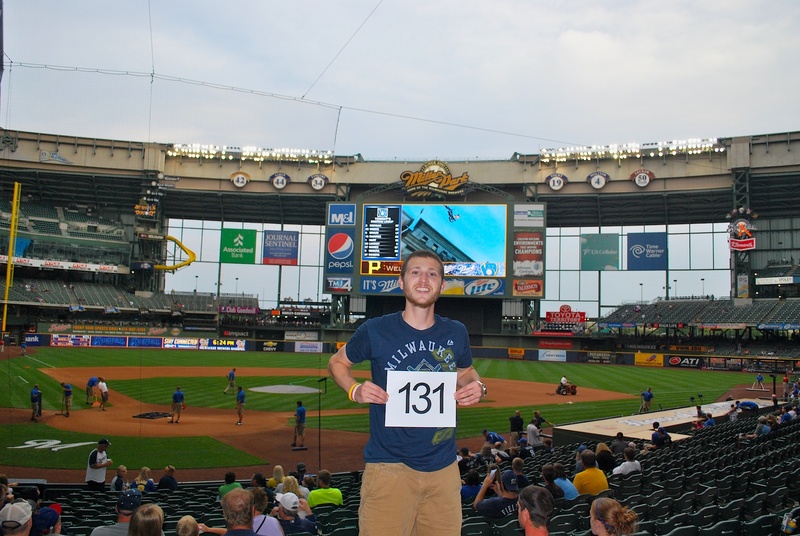 He had texted me offering to take the game number photo and we went down to section 116 to get the photo for game number 131. Thanks Jason! To honor Uecker on the day of his statue unveiling Jason bought a Uecker seat. I took a picture of it with the Uecker seat location (way) off in the distance. The Uecker seats are in the upper deck, and go back from the two giant supporting beams (they’re obstructed view seats, thus the $1 price tag). 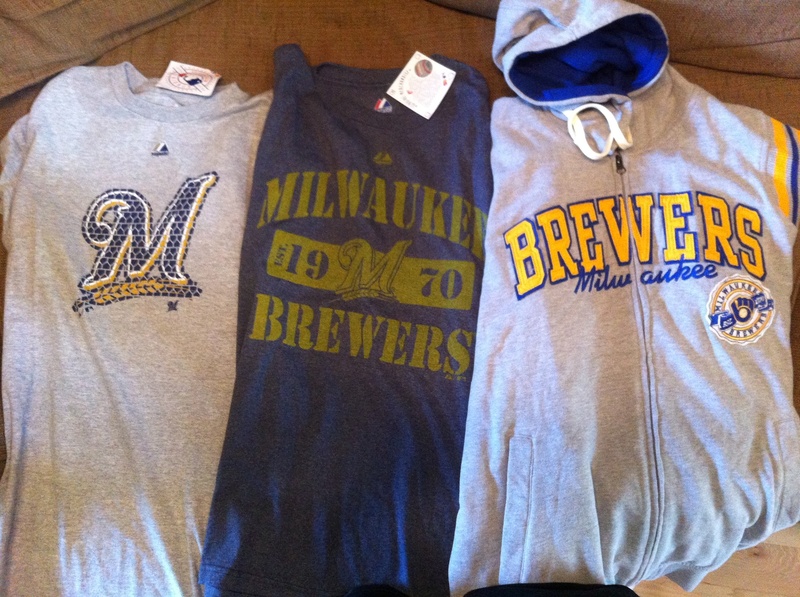 I went over and met with Nathan who had the final offering of merchandise that the Brewers have graciously provided me. 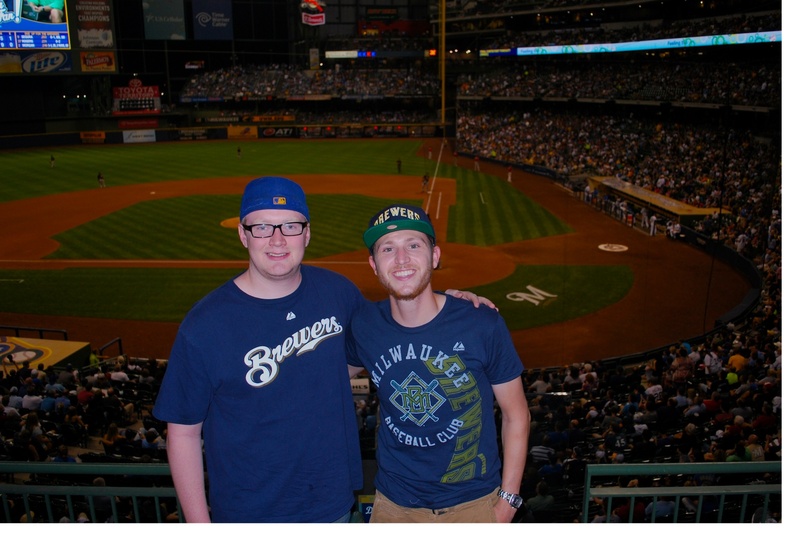 We talked for a bit about baseball and what next year might bring for the Brewers. We parted ways and I thanked him for getting the apparel to me. Thanks again to Kathy, Tyler, and Jill for working with me and providing free stuff to wear. On Friday I got two t-shirts and a hooded sweatshirt. A twitter follower had offered his two tickets to Saturday’s game so that I could sell mine for a donation. I met with Ed behind section 120 and he gave me his season tickets for section 116. Thanks Ed! I’ve mentioned on Twitter that mine are available for Saturday but haven’t gotten any responses. I might be forced to scalp mine, which isn’t always fun. The fact that the buyer would be making a donation to Be The Match should help my cause. I met Matt, a twitter follower who agreed to join me for Friday’s game, in our seats as the national anthem was starting. 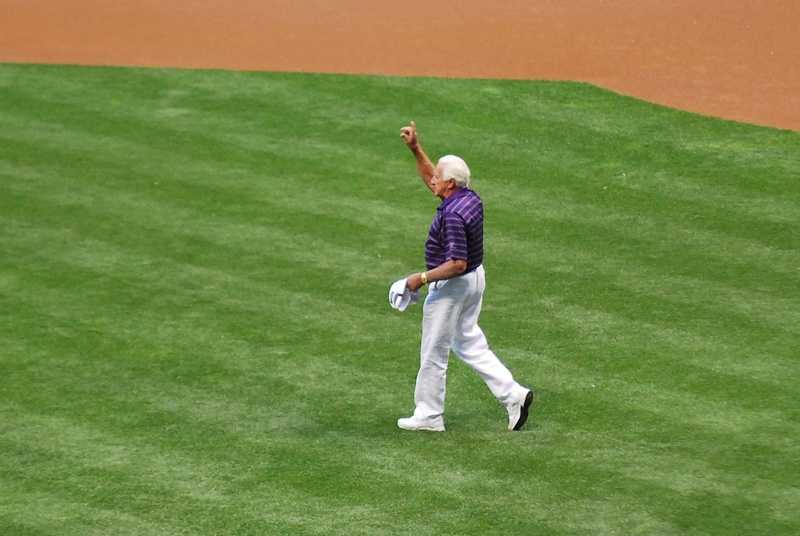 After the anthem Uecker was announced and he made his way to the mound to throw out the ceremonial first pitch. He was getting a standing ovation as he walked out there. 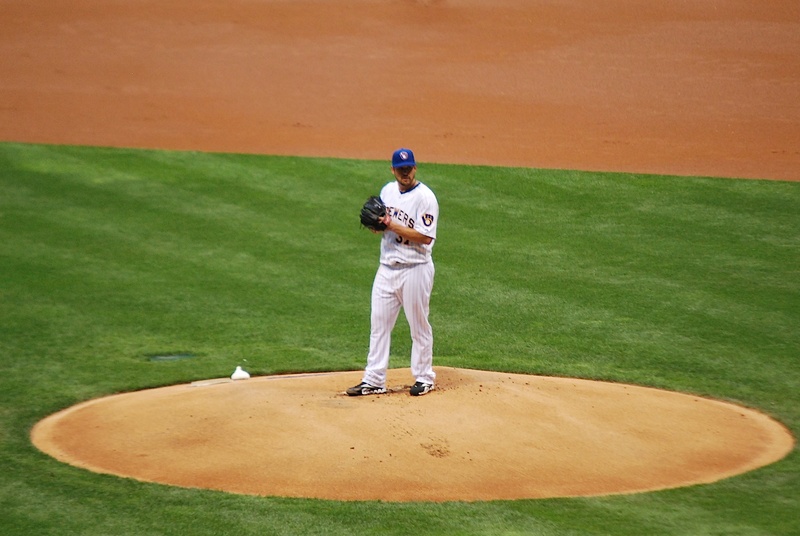 Mark Rogers was on the hill for the Brewers and the game started with him delivering a ball to Alex Presley. The Brewers got on the board early as Aramis Ramirez singled home Nyjer Morgan and Rickie Weeks in the bottom of the 1st. Corey Hart followed Ramirez’s 2-run single with a 2-run home run and the Brewers took a 4-0 lead. Here’s Hart rounding second as Pirates starter Jeff Karstens makes his way back to the mound. Karstens gave up a single to Lucroy and was removed from the game because of right hip flexor discomfort. It also may have been due to a bruised psyche. In the bottom of the 2nd the Brewers added a run when a passed ball with the bases loaded allowed Nyjer Morgan to score. 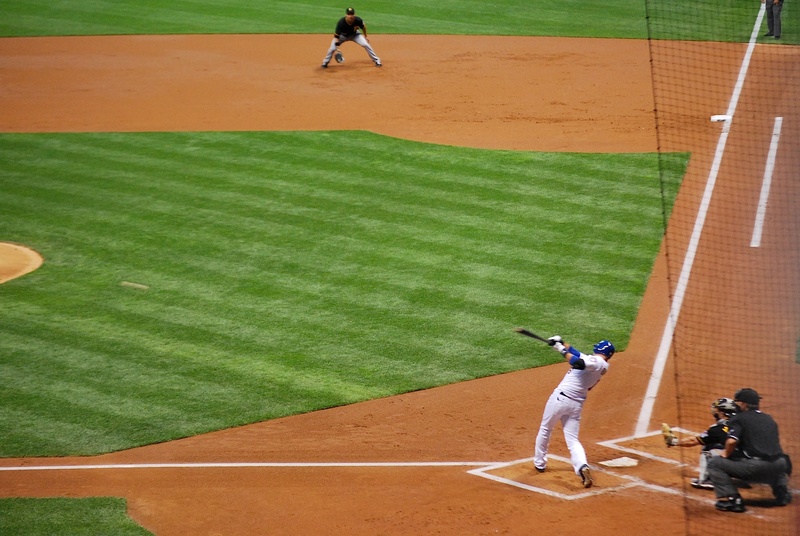 The bases were re-loaded when Corey Hart was hit by a pitch. Lucroy stepped in with a chance to hit grand slams in consecutive games. He struck out in a 9 pitch at bat and Gomez followed suit (on only three pitches though). Gomez swings extremely hard some of the time [read: most of the time]. 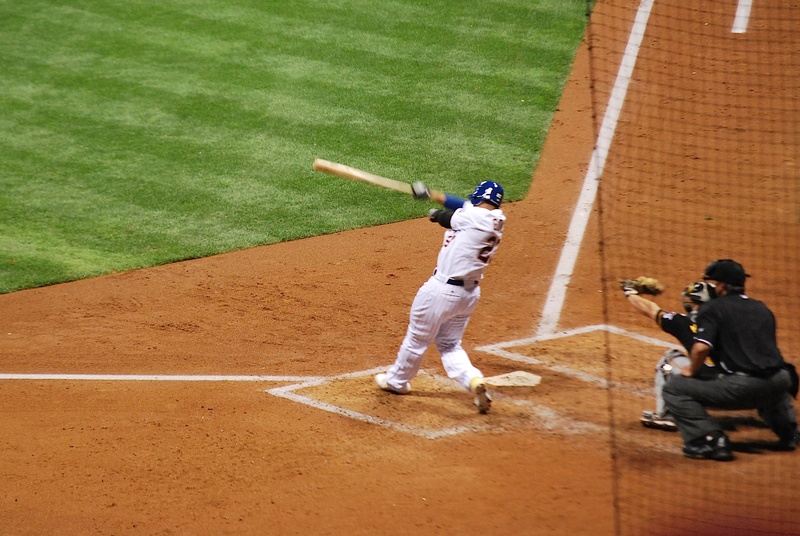 This at bat was no different and on one of the swings his left hand came completely off the bat. Garret Jones hit a solo home run in the top of the 4th and the Pirates cut the lead to 5-1. At halftime (the middle of the 5th) I had a fan a few rows in front of us take a picture of Matt and me. Matt donated $40 for his seat and I’m very grateful for his donation. If you’d like to make a donation to Be The Match, click here. If you want to find out more about joining the registry, click here. The Pirates cut the lead to three with an RBI groundout in the 7th. The Brewers added four runs in the 8th, the first coming on an Aramis Ramirez home run off the scoreboard. 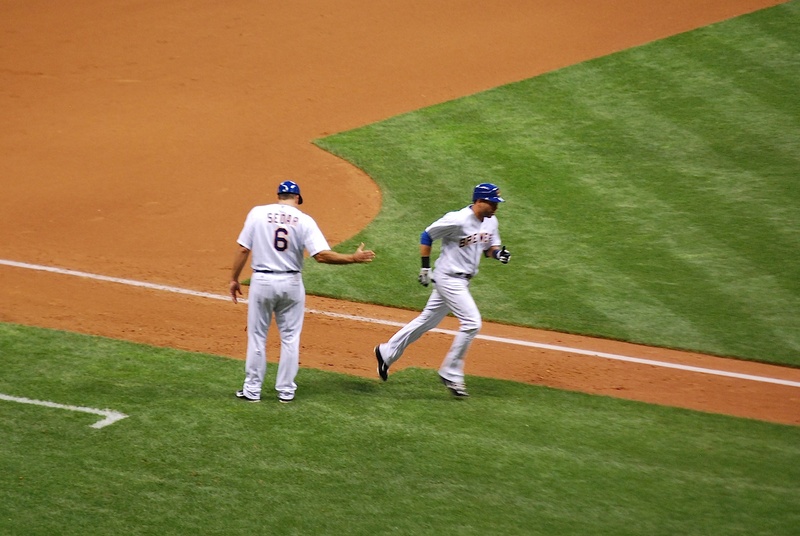 This picture makes it look like Ramirez ran past third base coach Ed Sedar without giving him a high-five. Despite what it looks like he did not leave Sedar hanging. 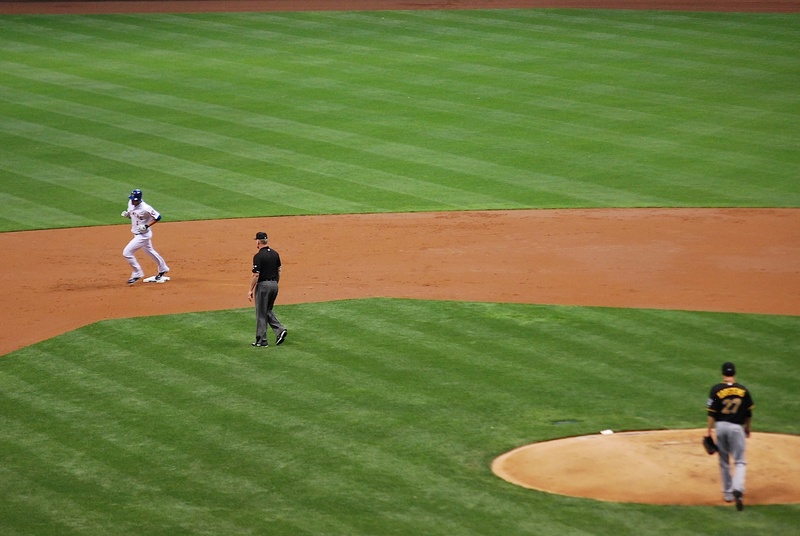 Lucroy followed Ram-Ram with a walk and Gomez drove him in with a double. 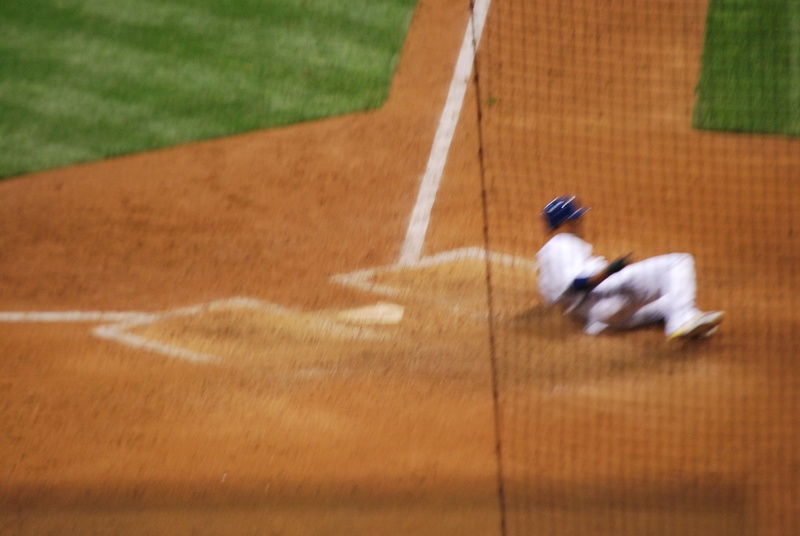 Segura’s single drove in Gomez and I got a (blurry) picture of Gomez after he crossed the plate. I showed Matt and he said it was blurry because Gomez is so fast. That is somewhat true but it’s mainly the fact that my camera isn’t the greatest, and freezing action at night doesn’t work very well. I saved the picture as “Gomez/big foot?” because blurry pictures always remind me of the grainy pictures of big foot that you see. The Pirates tallied a meaningless run in the 9th and the Brewers picked up another win. 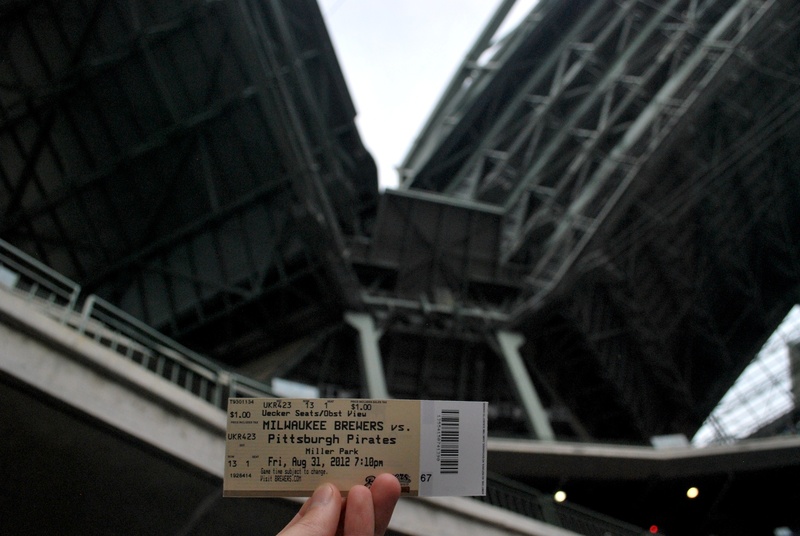 Final Score: Brewers 9 – Pirates 4. If it hadn’t been for the collapse on Thursday at Wrigley the Crew would have a 6 game winning streak and they’d *only* be 6.5 games back in the wild card race (they’re 7.5 back instead). I met Victoria at her Aunt and Uncle’s in Sussex, and she’ll be joining me for Saturday’s and Sunday’s games. We’re going to watch at least the first quarter of the Badger game (UW-Madison is our Alma Mater) and then head to Miller Park for game two of the series.